Small Aprons There are 8 products. 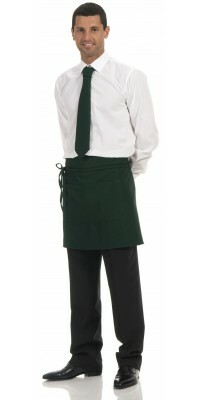 Corbara’s Professional Wear: “minimal” style Waist Small Aprons for a modern and young bar wear. In this series of professional wear the small aprons without bib (also called waist small aprons) are presented in six different colours, perfect for a young and practical bar wear. Made of wrinkle free polyester Gabardine, all the aprons can also be washed in the washing machine at high temperatures with an ensured long duration. - Novara Apron, for those who prefer a longer model, 45 cm of length, with a practical central pocket. Colours available: Black, Burgundy, Red and Green. - Bergamo Apron, 27 cm of length, for those who wish a “minimal” dimension; with wide central pocket. Colours available: Black. - Davantino Apron, 40 cm of length, without pockets. Available colours: Pinstriped Black and Pinstriped Blue. - Marsala Apron, 35 cm of length and narrower than the previous ones, it has a wide central pocket. Available colour: Black. Several other models of aprons are available in our selection of professional wear for Bars and Restaurants: discover all the available colours in the upper menu. Unisex short apron, model Marsala with big pocket appliedBlack coloursize cm. 35 x 65Made of Gabardine Plus, 100% Pol. Short unisex apron, model Novara with big pocket in the middleBlack coloursize cm. 45 x 85Made of Gabardine Plus, 100% Pol. Short unisex apron, model Novara with big pocket in the middleBurgundy coloursize cm. 45 x 85Made of Gabardine Plus, 100% Pol. Short unisex apron, model Novara with big pocket in the middleRed coloursize cm. 45 x 85Made of Gabardine Plus, 100% Pol. Short unisex apron, model Novara with big pocket in the middleGreen coloursize cm. 45 x 85Made of Gabardine Plus, 100% Pol. Short apron, unisex, model Bergamowith pocket appliedBlack coloursize cm.27 x 85Made of Gabardine Plus, 100% Pol. Short unisex apron, model Davantinowithout pocketsBlack Pinstripedsize cm.40 x 95Made of Victory Gabardine, 100% Pol. Short unisex apron, model Davantinowithout pocketsBlue Pinstripedsize cm.40 x 95Made of Victory Gabardine, 100% Pol.